In honor of National Children’s Dental Health Month we wanted to take a look at baby bottle decay. 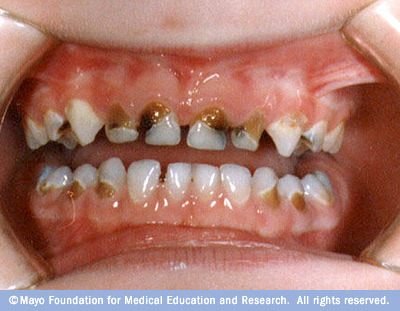 Tooth decay in infants and very young children is often referred to as baby bottletooth decay. Baby bottletooth decay happens when sweetened liquids or those with natural sugars (like milk, formula, and fruit juice) cling to an infant‘s teeth for a long time. Bacteria in the mouth thrive on this sugar and make acids that attack the teeth.